Roger D. Flood is standing in the rain on the deck of the Seawolf, straddling several ten-foot PVC pipes. He gestures and shouts towards a huddled group of students, trying to explain how they will drive the pipes into the seafloor to get core samples, but half of his words get carried away by freezing gusts of wind. His thick reddish beard is looking more and more like a wet piece of steel wool, and his graying hair is slowly becoming a slick helmet. He doesn’t seem to notice. Finally, a skinny young geology student moves behind Flood and attempts to shield him with an umbrella. Flood waves the student away, barely interrupting the animated description of the mud he hopes to dredge up. Being wet is no longer something that bothers him after 35 years of surveying the ocean floor. “It’s certainly invigorating to be involved in this kind of fieldwork,” said Flood, who is one of the leading oceanographic topographers in the world. In the last decade, he has mapped sedimentary deposits in Long Island Sound, the Hudson River, and off the Amazon River. By studying these deposits, he can deduce much about the history of a region: when certain species of plants and animals first appeared, how pollution levels have varied over time, and how the sea level has risen and fallen – a powerful indicator of global climate change. “One of those PVC pipes will show us about 3,000 years of history,” Flood explains, no longer having to shout, having finally acknowledged the misery of his students and moved the lesson below deck. On a model pipe, he points about a foot from one end and says, “That’s about 400 years ago, when the settlers arrived, so we’ll see ragweed pollen show up.” He also shows where the amount of lead will jump exponentially due to the advent of gasoline-powered engines, and where it will decrease again with the rise of unleaded gas. But before the samples can be taken and the history of Long Island Sound uncovered, the sonar beam must be used to determine where to core. Flood switches on the seismic profiler, which looks like a hulking dot matrix printer and makes about ten times more noise. The small cabin is immediately filled with the stench of burning plastic – the students who haven’t seen this monstrosity in action before are alarmed and disgusted. Many of them leave the room, already battling nausea from the pitching boat. But Flood and his graduate assistant, Juliet, grin, chuckle, and begin to joke about the profiler as if it’s the wet family dog – smelly, but loveable. Unfortunately, the wet dog isn’t delivering. The profiler seems to be working correctly, but it is printing nothing but gibberish. The rough seas and the boat’s engine are interfering with the signal from the ocean floor, and Flood can’t make anything out. He should be seeing a live printout of the contours of the bottom as the Seawolf passes over them, but the readout just looks like television snow. “No matter,” he says, switching off the machine with an amused shrug. “We already know where to core. I just wanted them to have the experience,” he says, and flashes a slightly mischievous smile. The equipment may be finicky, but once it’s calibrated properly it’s a powerful tool. By bouncing multiple sound waves off the ocean floor, Flood can determine what the bottom looks like. “He’s one of the major figures in shallow water multibeam mapping. There are not that many people who do this stuff,” said Frank Nitsche, a marine geologist at Columbia University’s Lamont-Doherty Earth Observatory. Nitsche and Flood worked together on the Hudson River Benthic Mapping Project, also collaborating with biologists to determine where marine organisms live and the health of their ecosystems. The characteristics of a riverbed, including geological and man-made structures and sediment grain size, predict that certain animals and plants should be living in specific areas. If those organisms are not found where they should be, that’s an indicator that the ecosystem has been harmed, by pollution for example. Except in Long Island Sound. There, Flood knows exactly what he will find. He’s already mapped this part of the Sound extensively, and chooses a location that he knows will yield an interesting core. Because this particular trip is for educational purposes rather than new research, his goal is to give his students a taste of the life of a marine geologist. And it’s quite a taste. The rain has turned to sleet and the Seawolf is rocking so much it’s hard to stand up. The students warily don their ponchos and lifejackets – it’s time to attempt the first core. On larger, more sophisticated research vessels, the coring equipment is automated. Cranes and pulleys do the heavy lifting. But the Seawolf is an 80-foot converted fishing boat that is hardly ever used to take core samples, so the crew and the students have to maneuver the PVC pipe underneath a suspended 600-pound weight and bolt it on manually. Then the whole contraption swings over the side of the boat and is lowered into the seafloor. But this theoretically straightforward operation turns out to be much more difficult than anyone, including Flood and the crew of the Seawolf, had bargained for. The pitching boat and the wind are whipping the suspended pipe all around the deck, and everyone starts to fear that someone’s neck will be broken. All of the students take refuge inside the ship, leaving Flood and one crewman to wrestle with the wildly swinging pipe. They finally succeed in taming the beast and getting it over the side of the boat, and their rapt audience, pressed to the ship’s small windows, sighs with relief. When the pipe is brought back up, two students keep it vertical so the layers of sediment inside don’t mix, and Flood sticks a broom handle down the top to see if anything was actually captured. Success! 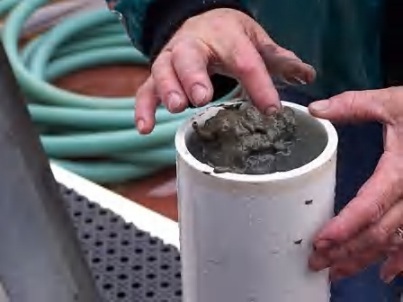 It contains about a meter of muck – a vertical sample of the sedimentary history of the Sound. Flood enthusiastically begins cutting away the empty part of the pipe, while his students take turns holding it in place and vomiting over the side of the still-pitching boat. “Now we’ll cap both ends, take it back to the lab, and split it open,” he exclaims, huffing with exertion. Someone points out that his finger has been cut and is bleeding, and asks if he’s okay. He glances at his bloody hand and keeps sawing, saying nothing about the injury, but continuing to talk without missing a beat.